Genius Loci Games: Quarters Not Included! Back when I was nine-years-old, I like many of my generation, spent far too much time in dimly lit, loud and smoky places deemed to be havens of depravity and generation wasting; arcades. Every summer, every cent I made mowing lawns, watching kids, or found in the bottomless pits of furniture went into the coin-slots of my local arcade, a small neon laced hole-in-the-wall at the corner of the mall known as "Space Port". Pole Postion, Street Fighter II, Mortal Kombat, X-Men and Ninja Turtles swallowed coin after coin. But one game, ruled them all, one game that bound me to the arcade and held power over my existence and shaped my years to come: Dungeons and Dragons: Tower of Doom. For three years I played Capcom's greatest beat 'em up game. I never beat it, I would always die fighting the dragon near the end, but that didn't matter. Death never mattered, winning never mattered. To my young self, the adventure the paths ways and slim decisions, the beautiful artwork and character designs were what mattered. What more, it gave me a name, a name that I hunted after until I joined the Army and found others who know it as more than a Saturday morning cartoon. Based on the basic rules of the world's oldest role-playing game, Tower of Doom introduced me to many of the iconic things about D&D and shaped my mental image of it until this day. My elves don't look like Tolkien's elves (despite being a huge fan of the books), no they look like "Elf" from this game, trolls, goblins, all of them look like they did in this game. That is the greatest thing about Tower of Doom and its sequel Shadows over Mystara, they were the greatest gateway drug for Dungeons & Dragons and besides that great games. Now, after years of begging and pleading and issues with copyright, Capcom is finally re-releasing these classic games on damn near everything. All the action, the adventure and oh yes, the glorious multi-player (and now I don't have to give up my quarters!) are all back again. So, find me on Steam, play with me and once again (or maybe for the first time) relive the adventures in the Hollow World, in Mystara ... and if you're a player in my "Age of Wanderers" game over at Roleplayinggames.net, finally know who this Daimos I keep mentioning is! 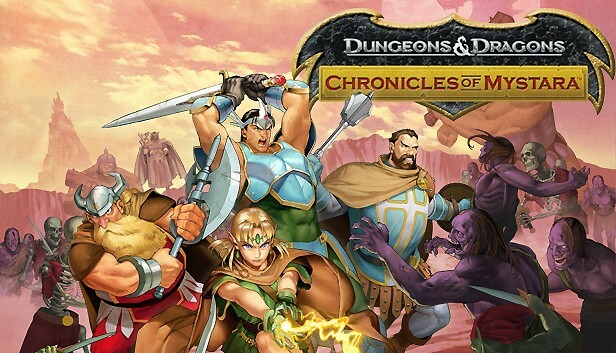 Dungeons & Dragons: Chronicles of Mystara is now available on Playstation Home, X-Box Live Arcade and Steam.